Hindi Lyrics 4 U: Lyrics Of "Party Time" From Latest Movie - Yea Toh Two Much Ho Gaya (2016). Lyrics Of "Party Time" From Latest Movie - Yea Toh Two Much Ho Gaya (2016). 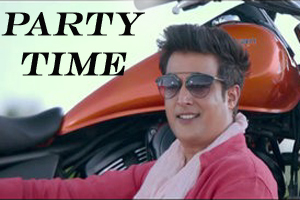 A party song sung by Bhoomi Trivedi featuring Jimmy Sheirgill and Bruna Abdullah. Star Cast: Arbaaz Khan, Jimmy Sheirgill, Pooja Chopra, Murli Sharma, Bruna Abdullah, Zarina Wahab, Vijay Patkar. The video of this song is available on YouTube at the official channel Zee Music Company. This video is of 2 minutes 00 seconds duration. Lyrics in Hindi (Unicode) of "पार्टी टाइम"